In 1978, the freeway speed limit was 55 miles per hour. 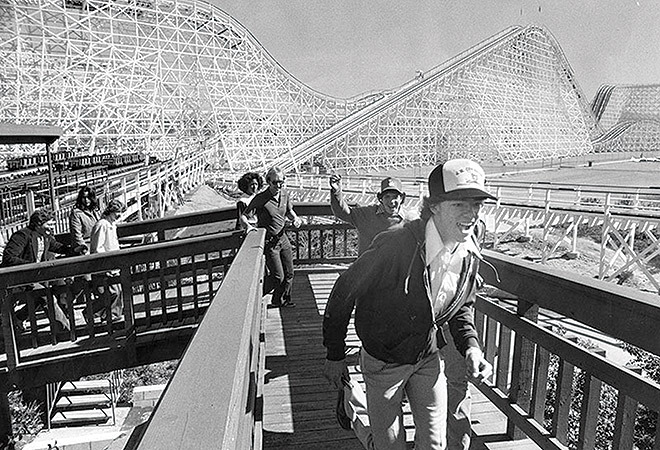 Colossus—deemed the world’s fastest wooden roller coaster when it opened at Six Flags Magic Mountain that year—whooshed at a peak speed of 62. Time flies, but unfortunately the dual-track racer won’t. After carrying tens of millions of riders in its 36 years, Colossus takes its final joyride on August 16. Built for $7 million by Bernards Brothers Construction in San Fernando, the coaster, which had a cameo role as “Screemy Meemy” in 1983’s National Lampoon’s Vacation, no longer cracks the top ten of theme park pleasures. But while Colossus isn’t considered the zippiest attraction by today’s stomach-churning standards, anyone who’s ridden its trestles knows the truth: That 100-foot drop (along with the rickety rumble and the sway of the structure) makes for three minutes of exquisite terror. Farewell, old friend.